Horreur 4: An unusual funfly. This planes continues the tradition of the "Horreurs", a series of ugly, quickly built, highly resilient funfly planes. This version of the Horreur has a pusher prop and twin tail booms. This configuration avoid damaging the motor and prop in crashes The carbon tube/Depron construction used here (see pictures below) makes the plane practically indestructible, and ideal for funfly rookies. design/construction: Yann and Kevin LeCun, summer 2003.
motor: modelmotors Mini AC 1215/16 brushless motor (available from Hobby Lobby) with GWS 4.5:1 gearbox (normally for speed 300), and JETI 18 brushless controller. prop: anywhere from an APC Electric 9x6 (for a gentle flight) to a GWS 1080 (for unbelievable thrust-to-weight ratio). battery: 3-cell I-RATE 1300mAh LiPo (which replaced the old 8-cell 700mAh NiMH (AAA)). 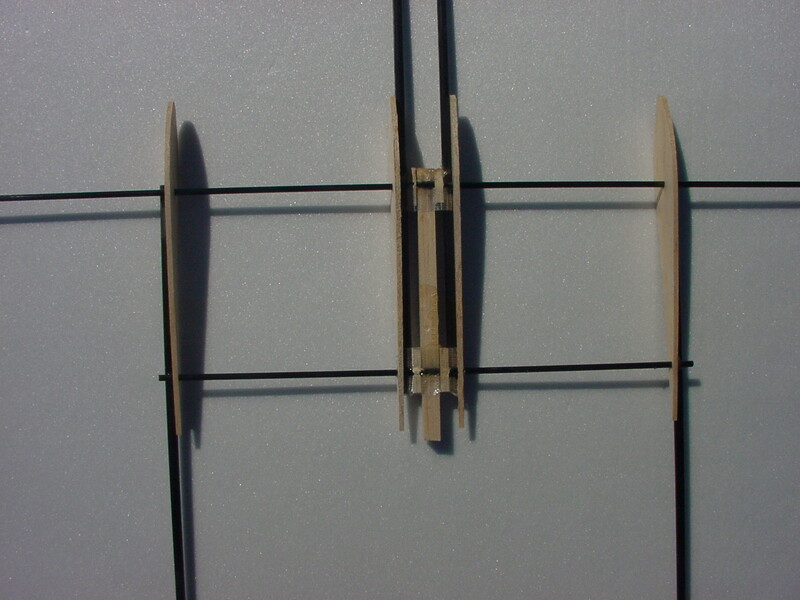 fuselage: twin tail booms (built from fishing rod sections). Front section consists of two 6mm carbon tubes placed 20mm apart. flight: Very easy and fun to fly. 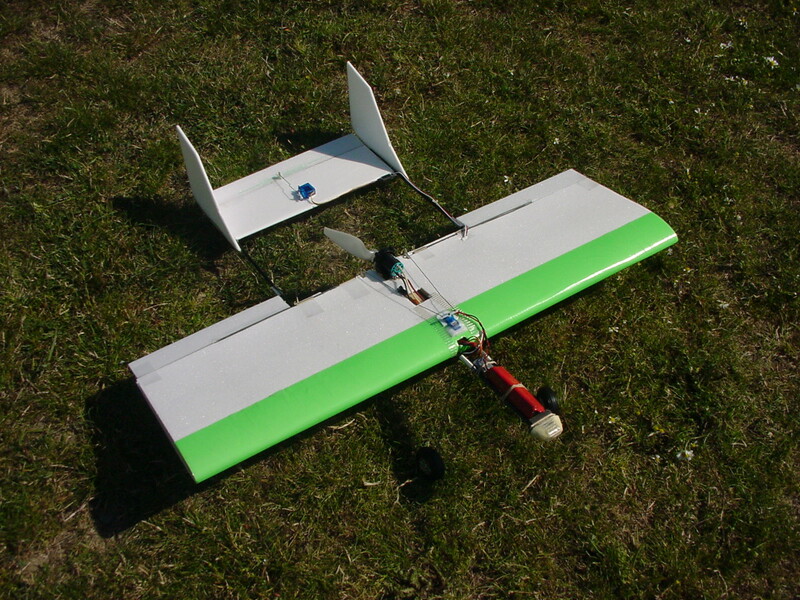 With the 9x6 prop and the NiMH battery, the speed is low, but there is plenty of power for quasi vertical climbs. With the 1080 prop and the LiPo battery, it's a rocket (the current consumption at full throttle is around 20 Amps). 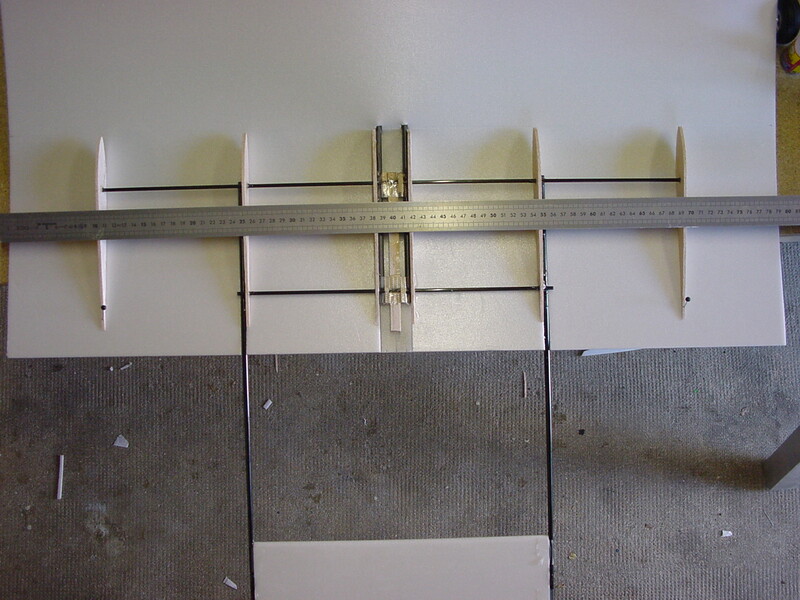 I haven't carefully measured the thrust to weight ratio, but it's somewhere around 3 to 1. I have never seen an electric plane accelerate so fast! The version shown has no rudder control, but that's a mistake: there should be one. This plane is pretty much indestructible. It is built around a carbon tube frame shown above. All the heavy things (motor and battery) sit on the "fuselage" made of two 6mm carbon tubes. The 4mm carbon tube spars are epoxied to those, and the carbon tail boom to the spars. This makes for a very strong and lightweight frame. I like playing games like flying at full speed, inverted, a few centimeters above the runway. Twice, I misjudged the altitude and the plane hit the ground at full speed. There was NO DAMAGE WHATSOEVER. I just grabbed the plane and tossed it in the air again.